Lobsang Dargey on Wednesday pleaded guilty to two felony charges and agreed to spend up to 10 years in prison and pay up to $24 million in restitution to investors he defrauded. 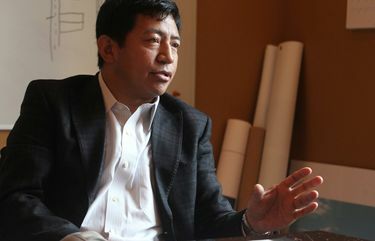 From his birth on the livestock floor of a primitive farmhouse in Tibet to celebrating multimillion-dollar deals with local luminaries in Seattle, developer Lobsang Dargey’s rise was swift and remarkable. And now, his fall is complete. A day after federal authorities revealed charges against him, Dargey on Wednesday pleaded guilty to two felonies that will likely land him behind bars for defrauding hundreds of overseas investors who entrusted him with more than $150 million. As part of a plea deal with prosecutors, Dargey, 43, has agreed to serve up to 10 years in federal prison and refund millions of dollars to his victims. After developing projects in Everett and starting a high-rise in Seattle, he had plans for big expansions: from Shoreline to Kirkland to California. He relied mostly on money from investors in China that he told would get a “green card guarantee” under the federal EB-5 program, which grants permanent U.S. residency to foreigners who make large job-creating investments in the United States. But the federal government’s investigation, from the Securities and Exchange Commission to the Department of Justice, revealed much of the money was actually going to enrich Dargey and his associates, and to fund his rapid expansion plans over the last several years. He owned a $2.4 million home in Bellevue, drove a $212,000 Bentley and racked up large jewelry and dinner bills. He also used bogus bank records to secure construction loans totaling $85 million and gave false information to federal authorities overseeing the green-card program, incorrectly telling them he had helped fund the projects himself. “Mr. Dargey exploited the dreams of his investors to line his own pockets,” U.S. Attorney Annette Hayes said in a statement. Still, it’s unlikely the investors will get all their money back. The investors have been in limbo since the SEC shut down Dargey’s company, called Path America, in August 2015. Their green-card statuses remain uncertain, though many moved to the United States after receiving conditional short-term visas before the charges were brought. Under the charges to which Dargey pleaded guilty, the federal sentencing guidelines call for a prison term of 11 to 14 years, though the maximum sentence in this case has been capped at 10 years. Arnold said he expects to ask a judge this spring to order a “significant term of imprisonment.” But Dargey’s attorney noted there’s no minimum punishment and said the sentencing would be up to a judge. Dargey, dressed in a dark suit and red tie, repeatedly said “Yes, your honor” in a soft voice in response to Judge James Donohue’s questions, but otherwise did not speak or show much emotion at the hearing. He was flanked by three lawyers paid for with help from a $1.8 million pot of money given to Dargey by the new developers of his signature Potala Tower high-rise in Belltown, which recently resumed construction under new management. Dargey also mentioned he has only a second-grade-level education and could not read English beyond an elementary-school level. He pleaded guilty to two felonies: Conspiracy to commit wire fraud and concealing information from the federal government, which were enhanced because of the magnitude of the fraud. As part of the plea deal, the government said it wouldn’t bring charges on other, undisclosed potential offenses. Mahler added that the projects in Everett and Belltown were headed for successful outcomes under new owners, helping the investors recoup some cash and local communities receive the jobs and economic benefits they were hoping for. Dargey, whose assets have been frozen, has surrendered his passport, and prosecutors agreed not to attach a GPS ankle monitor while he awaits sentencing on April 6.